That’s it. You just found the perfect composition but there is a problem. The interesting bit does not fit with the other interesting bits. So you sacrifice and change to a wider angle lens but that does not improve the shot. In fact, you can’t get an image wide enough or tall enough. Let’s change our frame of reference for a moment because not many people think about the ability of panoramas to connect the foreground to the heavens. Although taking truly panoramic star circles is next to impossible within a reasonable budget, you can connect the earth with the sky with a little bit of planning and some tricks to aid in your alignment later in the process. 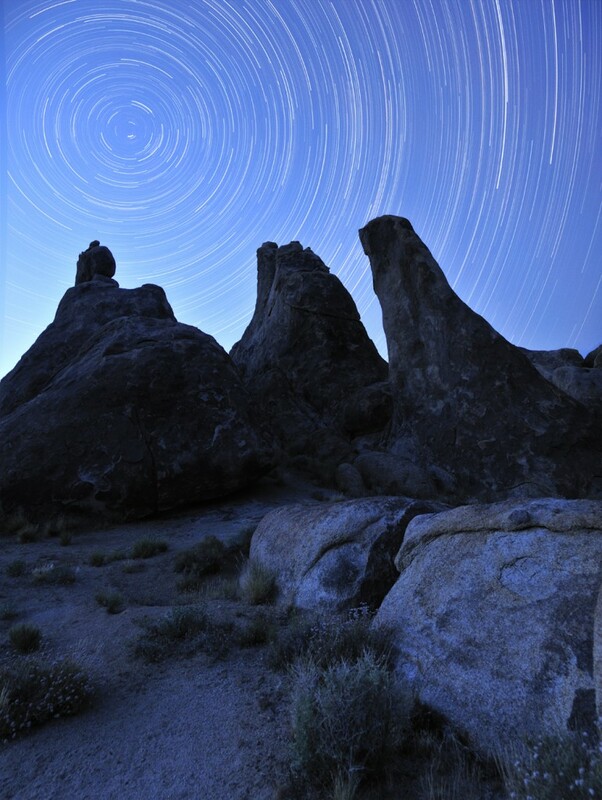 We are proposing a vertorama that is a “vertical panorama” to extend our photo to the ground and blend it into the star trail on top. Our approach will be to shoot in landscape mode and tilt our camera up as we progress. We can take a series of two or three shots but it will look odd if the star trails don’t extend into the edges of solid land (lower portions). We also have to make sure that we don’t end the last frame too high as this leaves the star trail disconnected from the ground (lower) images. The minimum amount of gear required is a camera a tripod and an interval timer. However the whole process is going to get much easier if we have a method to align the “no parallax point” with the axis of rotation. Huh? 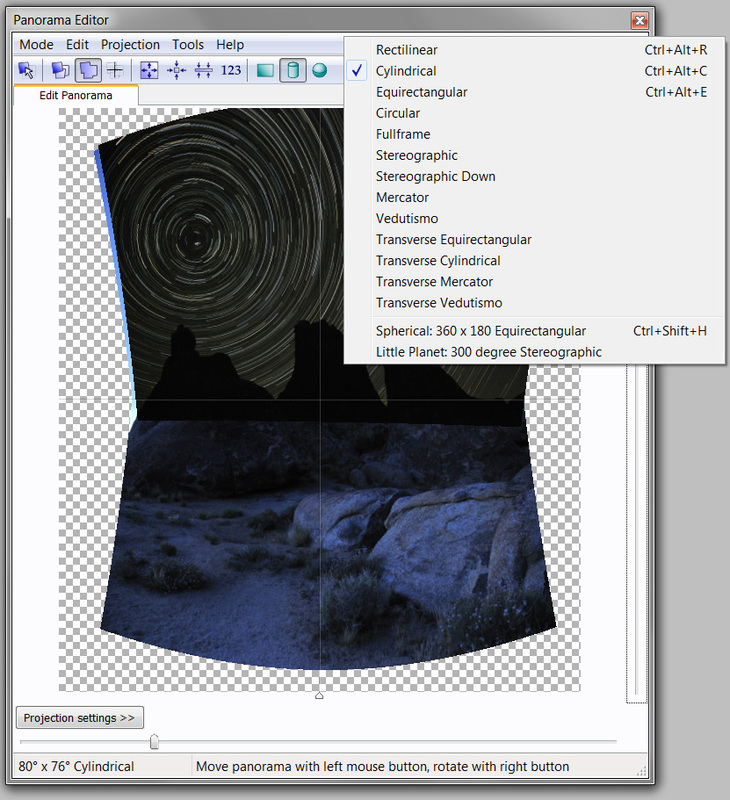 What did you just say…If you didn’t get that last sentence I suggest you read our primer articles on panoramas here and here or by following links out to other resources. By this time I am assuming that you have read all of the prior articles on shot planning and alignment. If not they can be found here, here, and here. Now that we are up to date on planning and alignment we can get into the gory details. We are going to have to take some additional steps to help in the alignment in post processing. I can get obsessive about the details but I want to do it right not get back to my computer to discover I spent 4 hours in the cold, dark night with stars and nothing interesting in the foreground. I begin with an idea of how I want the image to look then I walk around with a compass and the local north declination adjustment to fine tune where the center of rotation will be in my final image. I set up my tripod where my chosen foreground will be in alignment with Polaris (aka The North Star). Before I take the first photo I know where Polaris is going to appear in my frame. When I am really particular I will use a laser line to insure I have the object exactly where I want it in the photo. I then level the tripod and assemble the pano head. I use the pano head to determine the elevation of the north star this helps me know exactly how high the star with be in the sky. This helps me to see where the star circle is going to be in the photo. [Editor’s comment: If you know the angle of view of your lens you can determine the altitude of the north star by using your camera’s field of view as a measurement]. Knowing how high Polaris is in the sky will help me to determine the overlap I need to include all of the elements in the photo I want. This all may seem like over-kill but to go home and thinking you have an image of a lifetime only to find you have a dud is not fun. These are some of the images the top and bottom of the vertorama. I took right before the blue period ended. 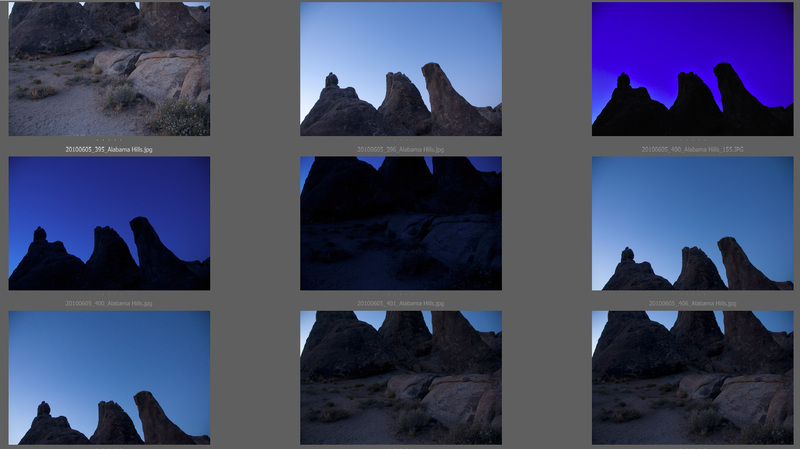 You can see the various bracketing and over lapping I did. 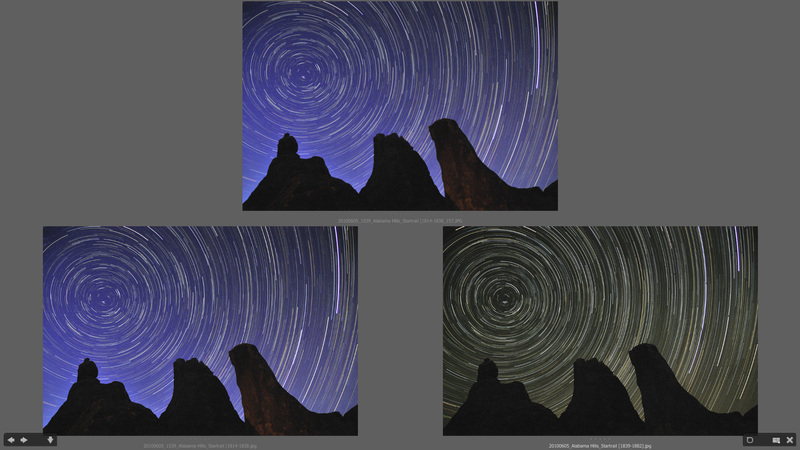 I assume that you already know how to process your star shots into star trails. 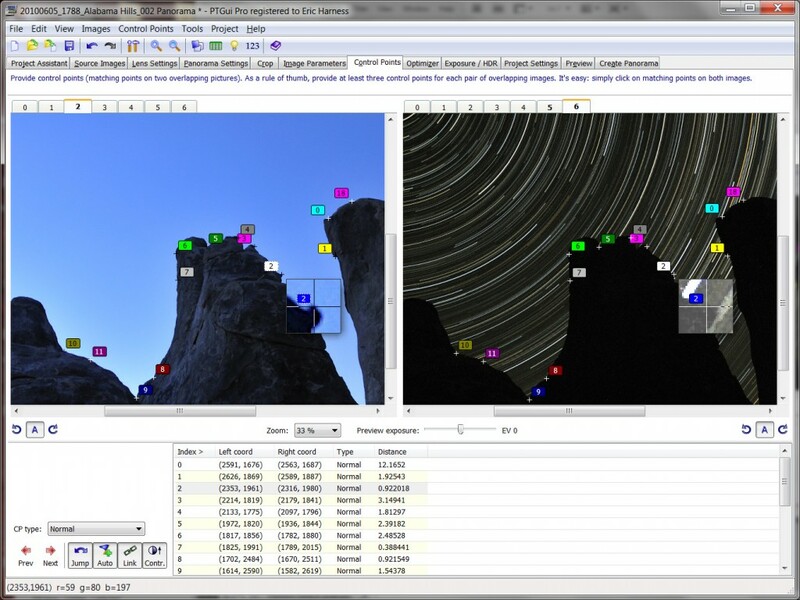 If you need a refresher check out Steven’s articles on star trail creation. I like to do a few different versions of the with stars because I like to include different amounts of blue and so I have an easier time blending them in later in the stitching process. Just some of the Star Circles I generated using different amounts of blue period photos.Combining a star circle with a foreground can be done with several different stitching engines, I prefer PTgui, however for other stitching engines the workflow is similar. Your images may be bright enough to do the whole process with Photoshop’s stitching or in Microsoft ICE engine but if you are blending in photos to get a darker sky then Photoshop might be a dud. Also these stitching programs will not allow you to add control points to help align and warp the image to the background and let me be the first to say the alignment and warping the foreground image is not fun or easy. I like to import a lot of different bracketed images into the stitching engine just so I can have some variety to work with. Also it will allow me the automatically find control points on overlapping images and then tell the software that the other images have zero pixel shift from that image in the bracket series. 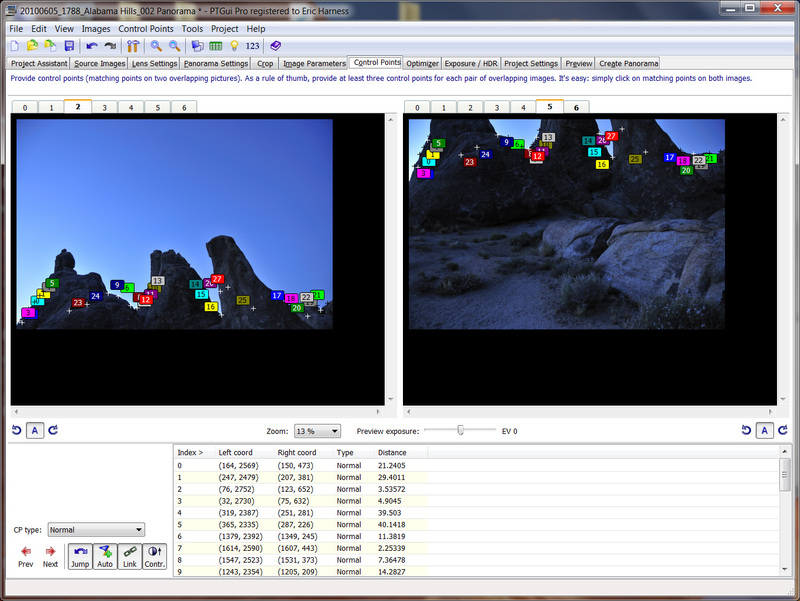 This allows me to save time by putting control points on only the images that are dark or match the star circle image. 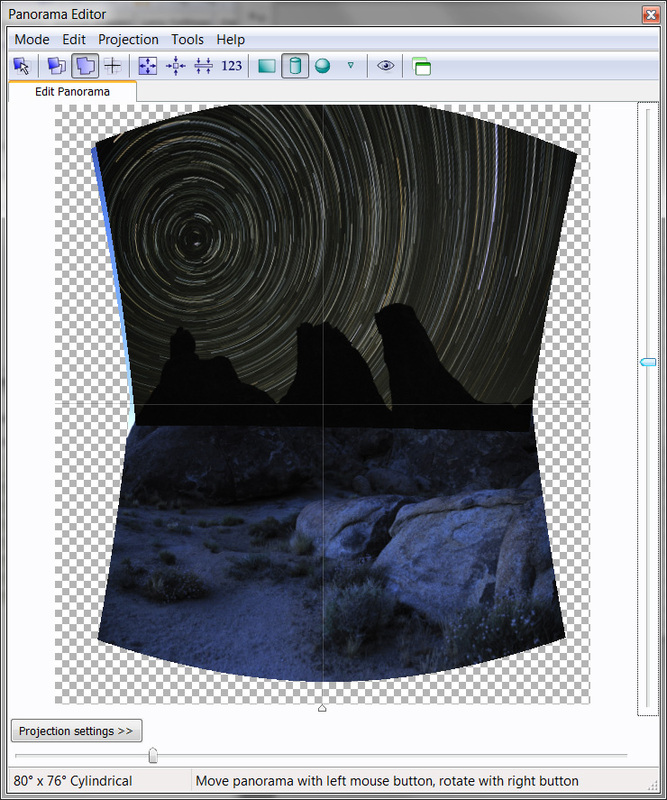 Thus I can align and blend the pano in one step then use Photoshop to blend in the stars. Once imported click the align images, did it work…if so hooray!! You now only have a small amount of clean up to do (skip down to the projection part of the article). 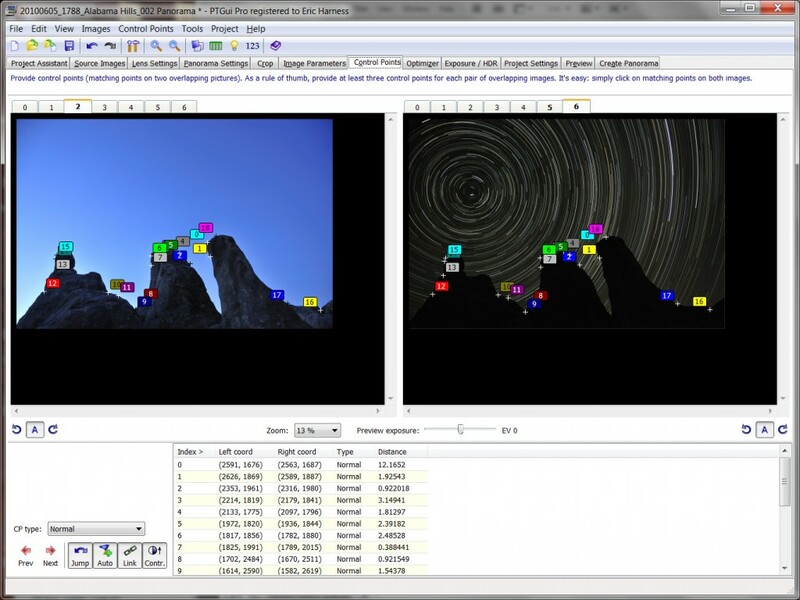 If not then you have to add some control points and align the images yourself. 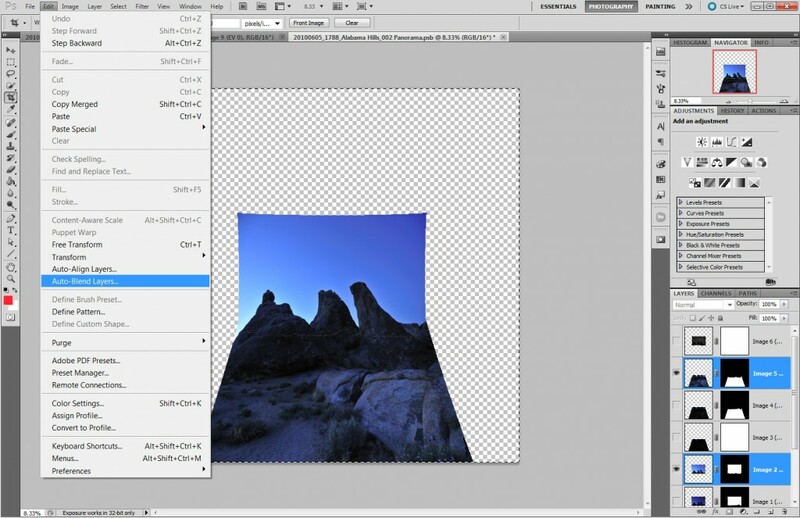 Control points are areas on an image that match in overlapping images the software needs to know these areas to know how to warp adjacent images to stitch them together. So lets look at how PTgui does this. Below is a screen shot of PTgui’s control point placement feature. Control points selected between the star circle image and the bright forground image. I pick areas in the image that have 1) sharp contrast, 2) Jagged edges and 3) don’t move. All you have to do is open the adjacent images at the seam and then zoom in to find distinct points that match. I like to use object with good contrast and unique shapes to help guide my cursor to a pixel accurate match. In the image above you can see that the transition between the rock and the sky is the area of overlap. I follow the rock edge because of the contrast between the sky and the rock but also it has bumps that are easily distinguishable between the top and the bottom photos. Once I have these set I do the same for the star trail photo see below. I will align the star circle photo with the corresponding photo of my foreground just so I have less stitching errors and it is easier to align. Again if the star circle is light enough then these images may automatically align. 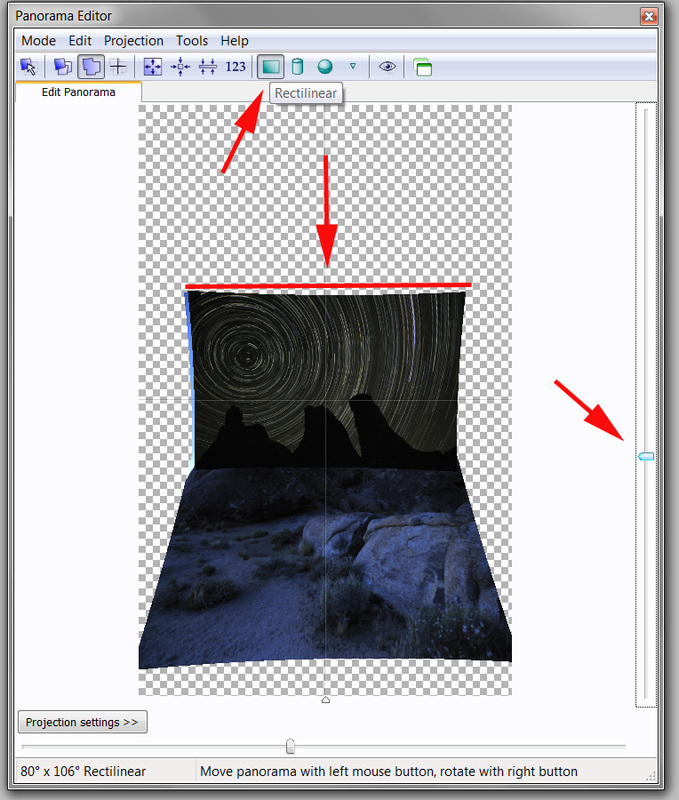 Once all of the images have control points then I will go and see how the preview of the image looks in the panorama editor. Looking at the stiched images in the panorama editor for the first time to see the errors in overlap and the corrections needed to correct the distortion. You can see the top and bottom images of the vertorama are properly aligned at this point don’t worry about the blending we will handle that later in photoshop. Two things are very off, causing distortion of the star circle 1) the projection and the vertical height of the image. The projection is the way the images are projected on to the inside of a sphere during the alignment. If you are interested in the types of projections (and there are many in the image below) and how the distortion affects the overlap and warping of your image more info can be found here. I am not interested in the type or how it works in this case I am just worried about what looks right. For most vertorama star circle images the “Rectilinear” projection often looks the best but is not always the case. Correcting the projetion to make the photo appear flat and not as distorted at the edges. We can quickly correct the oblong star circle by moving the top image toward the bottom. This will change the amount of space that is blank but once we crop the image those areas will not longer be visible anyway. Changed to rectilinear and moved the whole image down. You can see I changed the vertical FOV with the slider on the right (right red arrow) I changed the projection at the top to rectilinear. and the line in the middle shows the movement of the image down. Once you are satisfied with the preview the next step is to use the image optimizer to hone the control points to reduce the error. It is so easy I am not even going to include a photo just click and tab and click optimize. It will give you a rating “very good”, “good”, “not bad”, etc. then suggest some corrections my usual experience is just accept them they more often help then harm. The only step left is the output the files and then mask them in photoshop. Go to the “Create Panorama” tab and preview the settings. You can see the settings I use is to output the images as a “.psb” for use in photoshop but you can output what ever you would like. The most important is to output into 16bit layers under the “LDR file format” or “HDR file format” settings. This is shown in the screen shot below. Since the blending is going to cancel out some of the stars the aligned images need to be output in seperate files so. I will uncheck the image that represents the aligned star circle in the screen shot below this is “Image 6” the rest of the images are the aligned HDR brackets. Then I will name the file something like “file….SC_BKGD” were file is the former file name and the “SC_BKGD” stands for “Star circle Background”. Once this is done stitching I output the star circle image alone. So in this example I would un-check the boxes next to images 0-5 and only output image 6. So once all of these images are outputted I select them and open them as layers in photo shop. If your blending went well in PTgui then great skip the next step and forward on to the next. If the blending shows seams or other artifacts of stitching follow then next steps. If the blending was bad then go back to PTgui mask out the areas the blending did not work so well if you have PTgui version 9, if not then output all of the layers and we will mask and clone in photoshop. I picked this example specially because I had blending issues in the past so if you have blending issues you will know how to approach them. This is the first tool I reach for when blending is the auto blend layers. Once the layers are aligned (and HDR-processed) thanks to PTgui the blending in Photoshop is usually easy. If the auto blend function does not work it is time for some good old fashion hand blending. 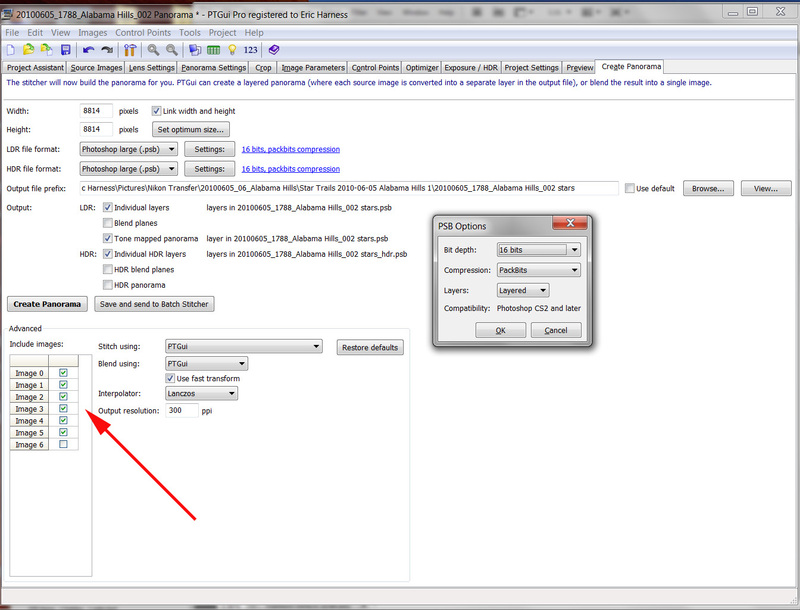 I will open the individual blend layers and the PTgui blended photo with blending issues. I will use the photo with blending issues as the background and layer over the top the individual planes to blend by using a mask to gradually make the layers more transparent using a big soft brush. I slowly make the seam fade or use the surrounding colors to add detail. I will also use the clone stamp to replicate areas like clouds and blend them into each other. This takes a lot of patience and practice to make some areas look “normal” but keep zooming in and out to see what affect you are having on the whole photo and local areas. Once the blending the top and bottom image is finished the star circle can be added. Since you exported it as a separate layer out of PTgui this can be brought into photoshop as a layer in the document. 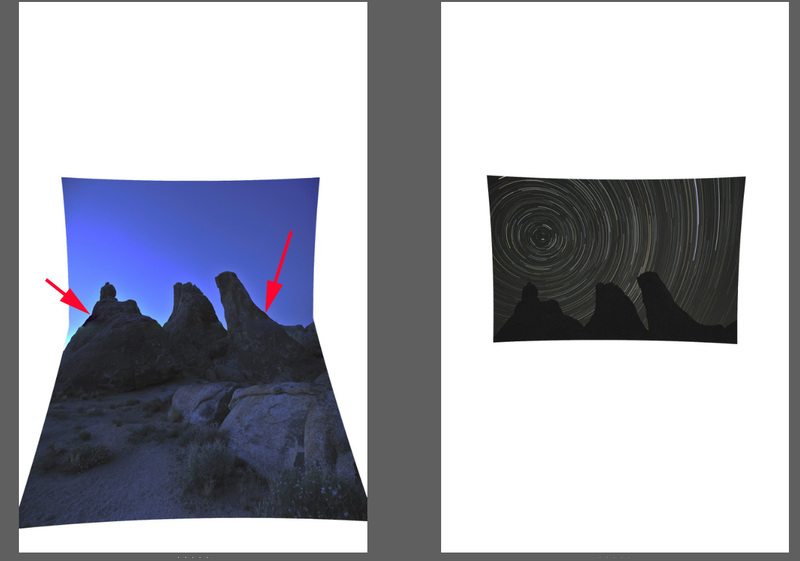 Opening the photo as a layer then by changing its blend mode to lighten or screen blend mode then bright stars will out shine the dark background. Thus adding the star circle to the finished photo was easy. Don’t forget to mask out some of the areas were affected by the screen blend. Say in cases of light pollution the foreground might be brighter then they should be. Crop then your done. This is the final image after the stars are added as a background layer and blended in using the screen blend mode. Thanks for reading, as always comments and questions are encouraged. If you have found this interesting please forward to your friends and follow us on Facebook. If you are interested in this topic (panoramas), night photography, shot planning, or super cool post processing techniques come and join us for a workshop. This entry was posted in Creativity, Image Stitching, Photo Processing, Photo Tip, Stacking and tagged base, control points, creative, exposure, f/stop, hyperfocal distance, leveling, night, panorama, perspective, PTGui, scale, shooting panoramas, stitching, tripod, vertorama on August 29, 2011 by Eric Harness.